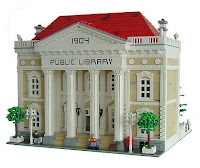 Brick Town Talk: 3 - Teddy (Johan) - LEGO Town, Architecture, Building Tips, Inspiration Ideas, and more! City Public Library by Teddy (Johan). Nomiated by LGOrlando. Great choice.